The first book of the New York Times bestselling Remnant Chronicles. She steals ancient documents from the Chancellor’s secret collection. The Kingdom of Morrighan is steeped in tradition and the stories of a bygone world, but some traditions Lia can’t abide. Like having to marry someone she’s never met to secure a political alliance. Fed up and ready for a new life, Lia escapes to a distant village on the morning of her wedding. She settles in among the common folk, intrigued when two mysterious and handsome strangers arrive—and unaware that one is the jilted prince and the other an assassin sent to kill her. Deceptions swirl and Lia finds herself on the brink of unlocking perilous secrets—secrets that may unravel her world—even as she feels herself falling in love. 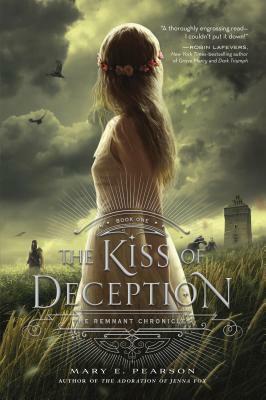 The Kiss of Deception is the first book in Mary E. Pearson's New York Times bestselling young adult fantasy series Remnant Chronicles. The adventure continues in the New York Times bestseller, The Heart of Betrayal, and comes to an epic conclusion in The Beauty of Darkness. Mary E. Pearson is the author of The New York Times-bestselling Remnant Chornicles and other bestselling, award-winning novels for teens. The Miles Between was named a Kirkus Best Book of the Year. The Adoration of Jenna Fox was listed as a Bank Street Best Children's Book of the Year, an IRA Young Adult Choice, NYPL Stuff for the Teen Age, and a School Library Journal Best Book of the Year. She is also the author of A Room on Lorelei Street, David v. God, and Scribbler of Dreams. Pearson studied art at Long Beach State University, and worked as an artist before earning her teaching credentials at San Diego State University. She writes full-time from her home in Carlsbad, California, where she lives with her husband and two dogs.